Like many other South American countries Colombia have two championships per year known as the Apertura (Opening) and Clausura (Closing) championships. The Apertura season runs from January to June, and the Clausura season runs from July to December. The 18 teams in Division A of the Colombia football league play each other once in each season as well as a special "derby fixture" where teams play an extra game against their traditional rivals to bring the total number of matches to 18. At the end of the regular season the top 8 teams form two groups of 4. Each team plays the other 3 teams in the group home and away. The winner of each group passes to the final which is played home and away. The winner of the final is crowned champion and receives a place in the following year's Copa Libertadores. Colombia's 3 biggest cities each have 2 traditional clubs. The capital city of Bogota is a bit of an anomaly in South American football. In every other South American nation teams from the largest city dominate the soccer scene, but a team from the Colombian capital has not won a title since 1988. Since the 1970s teams from both Medellin and Cali have had far more success than their counterparts in the capital. In Bogota the two big clubs are Millonarios (who play in blue shirts, white shorts) and Independiente Santa Fe (red shirts, white shirts). Both teams play their home matches at Nemesio Camacho El Campin Stadium. In Medellin are Atletico Nacional (green and white striped shirts, white shorts) and Deportivo Independiente Medellin (red shirts, blue shorts). Atletico Nacional has the larger following and refer to themselves as El Rey de Copas (The King of Cups) while Independiente Medellin's nickname is El Poderoso (The Powerful) - perhaps an insight into the lack of modesty in this part of Colombia! Both teams play at the Atatasio Giradot Stadium. Cali's two big clubs are America de Cali (red shirts, red shorts) and Deportivo Cali (green shirts, white shorts). America de Cali have a bigger fanbase than Deportivo Cali and play their home games at the Pascual Guerrero Stadium. 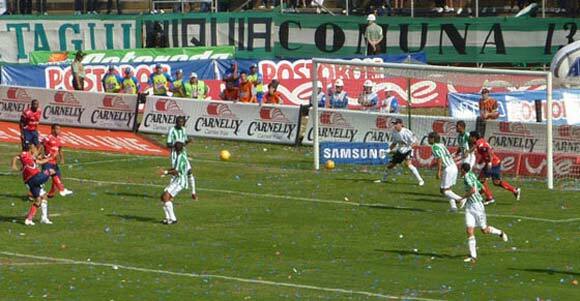 Since 2010 Deportivo Cali play their soccer at the Deportivo Cali stadium just outside Cali.